Jacobus Vanderveer House & Museum Receives $10,000 Grant From Investors Bank Foundation ~ The History Girl! 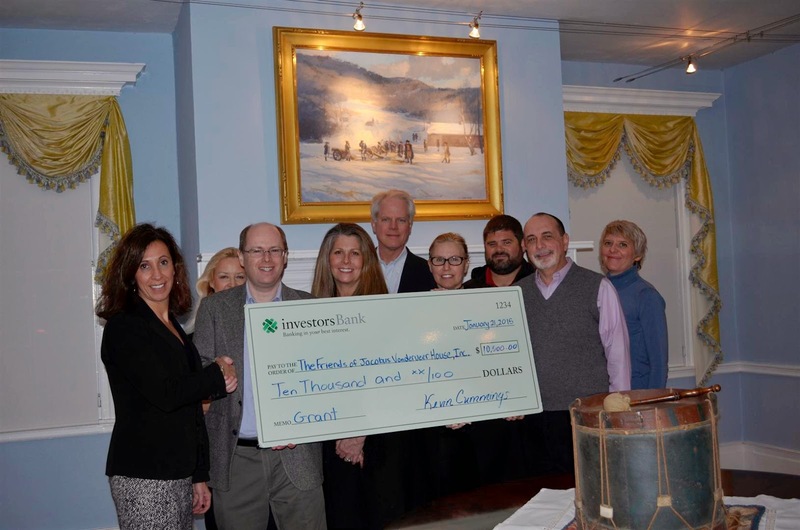 The Friends of the Jacobus Vanderveer House & Museum have received a $10,000 grant from Investors Bank Foundation to support educational programming for children. Investing in Education - Antonella Celli [left], Assistant Vice President and Branch Manager of Investors, Pluckemin, presents a check to trustees of the Friends of the Jacobus Vanderveer House & Museum, including [left to right] Nancy Schechter, of Warren; former Board President Sean Blinn, of Bedminster; current Board President Robin Ray, of Bedminster; Craig Sutherland, of Bedminster; Nancy Weeks, of Summit; Joseph Oszust, of Lebanon; Bernard Payne, III, of Bedminster; and JVH Program Coordinator Hillary Murtha. The Jacobus Vanderveer House welcomes school groups and scout troops at its Bedminster location throughout the year, explained Mrs. Ray, but for some school districts, bussing costs and scheduling are an issue. The grant will help defray some of those costs as well as allow the Friends to take educational programs on the road and directly into elementary, middle school and high school classrooms. In addition to having re-enactors give first-person presentations about historic figures, the Friends of the Jacobus Vanderveer House plan to offer materials culture presentations in local schools. The presentations would complement students’ traditional classroom learning with the hands-on practice of using artifacts and manmade objects to interpret and understand history. Teachers and administrators interested in learning more about educational programming offered by the Friends of the Jacobus Vanderveer House & Museum, should contact Hillary Murtha, Ph.D., Program Coordinator, at 908-396-6053 or email hmurtha@jvanderveerhouse.org.